I spent most of the day yesterday searching for a clear answer for installing pip (package manager for Python). I can't find a good solution. easy_install has been deprecated. Please use get-pip.py instead. ⚡️ TL;DR — One line solution. 2019: ⚠️easy_install has been deprecated. Check Method #2 below for preferred installation! I made a gif, coz. why not? ⚡️ OK, I read the solutions given above, but here's an EASY solution to install pip. MacOS comes with Python installed. But to make sure that you have Python installed open the terminal and run the following command. If this command returns a version number that means Python exists. Which also means that you already have access to easy_install considering you are using macOS/OSX. ℹ️ Now, all you have to do is run the following command. After that, pip will be installed and you'll be able to use it for installing other packages. Let me know if you have any problems installing pip this way. P.S. I ended up blogging a post about it. QuickTip: How Do I Install pip on macOS or OS X? Another gif you said? Here ya go! You can install it through Homebrew on OS X. Why would you install Python with Homebrew? I'm surprised no-one has mentioned this - since 2013, python itself is capable of installing pip, no external commands (and no internet connection) required. This will create a similar install to what easy_install would. pip is available on OS X via easy_install. When prompted for a password enter your normal login password. After the installation has completed you should be able to use pip as expected. The simplest solution is to follow the installation instruction from pip's home site. downloading get-pip.py. Be sure to do this by following a trusted link since you will have to run the script as root. The main advantage of that solution is that it install pip for the python version that has been used to run get-pip.py, which means that if you use the default OS X installation of python to run get-pip.py you will install pip for the python install from the system. 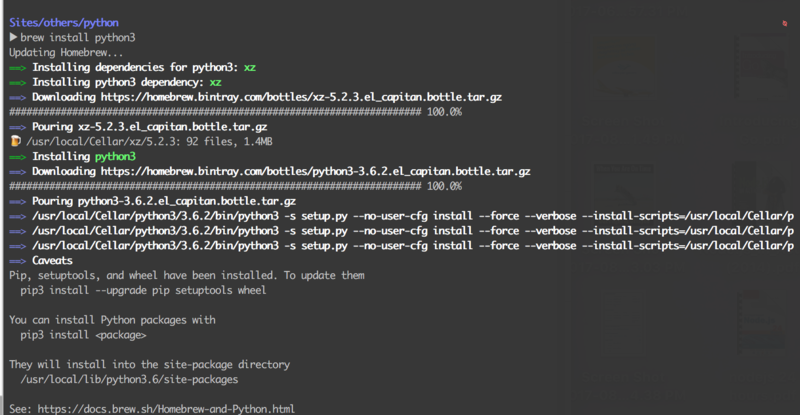 Most solutions that use a package manager (homebrew or macport) on OS X create a redundant installation of python in the environment of the package manager which can create inconsistencies in your system since, depending on what you are doing, you may call one installation of python instead of another. Mac comes with python 2, but not with pip. The directory '/Users/myuser/Library/Caches/pip/http' or its parent directory is not owned by the current user and the cache has been disabled. Please check the permissions and owner of that directory. If executing pip with sudo, you may want sudo's -H flag. The directory '/Users/myuser/Library/Caches/pip' or its parent directory is not owned by the current user and caching wheels has been disabled. Check the permissions and owner of that directory. If executing pip with sudo, you may want sudo's -H flag. If you install python 3, pip will be installed automatically. Installing a separate copy of Python is a popular option, even though Python already comes with MacOS. You take on the responsibility to make sure you're using the copy of Python you intend. But, the benefits are having the latest Python release and some protection from hosing your system if things go badly wrong. Now you're ready to install any of the 50,000+ packages on PyPI. Formerly, I've used get-pip.py to install pip. But, the docs warn that get-pip.py does not coordinate with package managers and may leave your system in an inconsistent state. Anyway, there's no need, given that pip is now included with Python as of 2.7.9. Note that pip isn't the only package manager for Python. There's also easy_install. It's no good to mix the two, so don't do it. Finally, if you have both Python 2 and 3 installed, pip will point to whichever Python you installed last. Get in the habit of explicitly using either pip2 or pip3, so you're sure which Python is getting the new library. On the recent version (from Yosemite or El Capitan I believe... at least from Sierra onward), you need to run brew postinstall python3 after brew install python3 if you use homebrew. On 1st March 2018 the python formula will be upgraded to Python 3.x and a python@2 formula will be added for installing Python 2.7 (although this will be keg-only so neither python nor python2 will be added to the PATH by default without a manual brew link --force). We will maintain python2, python3 and python@3 aliases. Then, the pip is installed automatically, and you can install any package by pip install <package>. Make sure you are on the same directory as get-pip.py or you supply the correct path for that file. pip will be available in new terminal window. Once you do that,you will have easy_install. Install python3 first, then use pip3 to install packages. Notice it's pip3 because you want to use python3. Somehow easy install doesn't work on my old mac (10.8). This solve my problem. I recommend Anaconda to you. It`s the leading open data science platform powered by Python. There are many basic packages installed. Not the answer you're looking for? Browse other questions tagged python macos pip install or ask your own question. Why is Python easy_install not working on my Mac? What are the risks of running 'sudo pip'? How do I check whether a file exists without exceptions? Install a Python package into a different directory using pip? Find all packages installed with easy_install/pip? How do I update pip itself from inside my virtual environment? How do I install a Python package with a .whl file?